You have an existing alarm system with a regular phone landline or upc landline: In this case we could install a GJD voice dialler near your alarm control panel or keypad and run a wire from this device to the phone line or upc box. This device works with almost any alarm. At present we are charging 200 euro including VAT for callout and installation of this device and this also includes full service of your existing alarm system. How does a Voice GJD message dialler work: You can record a message on it and program it with several phone numbers and then when the alarm activates it rings the numbers and plays the message. This device requires a standard telephone landline in the house. Existing Alarm With No Landline? : If you have an old alarm system and don't have a landline then you would be as well off to upgrade the control panel and keypad to a modern system which could use a gsm dialler. 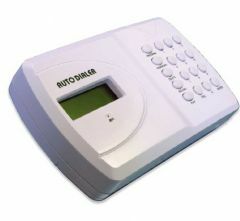 GJD Voice Dialler works with almost any alarm.